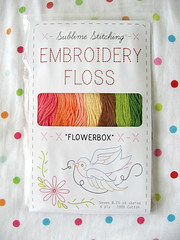 feeling stitchy: Sublime Stitching Floss Palettes - Team review and giveaway! they are all lovely! but I think I would choose breakdance. 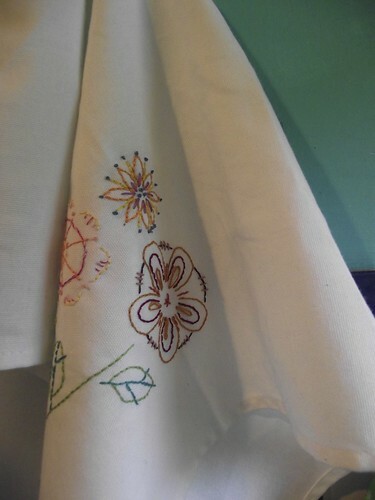 I might create a whimsical paisley embroidery pattern just for those, maybe in a hoop! Its a toss up. I love the bright colors of Prism but those Frosting colors are nice too, but if I had to pick just one I'd go with Frosting as my favorite (gotta love that name). PS. Great review! Lovely! I love the blended threads. Thank you for the giveaway! I love Fruit Salad and would use then on Christmas ornaments I stitch up every year for the family. I love BRIGHT Christmas colors. Thank you for the contest and for introducing me to this new floss brand. It's a toss-up between parlour and prism - I like the stronger colors better than the pastels. Not sure what I'd make with it. i love the colors in parlor, i am intrigued by breakdance, and i really want to try the mingles. :) i have some christmas presents to make for family and it would be keen to try the new floss! i love floss! I love the palette called Breakdance. We are in the process of painting our kitchen and I want to make some pretty tea towels. Love those colors. Thanks for the giveaway. I love the Parlour! I would probably embroider an 'F' for my baby's nursery. It's hard to pick, but I think I like Breakdance the best. They are all so pretty! Fruit salad and flower box are fighting for my heart. I absolutely love Parlour! The green, turquoise and dark purple colours would lend themselves beautifully to a grapevine, while the reds, orange and pink would look amazing in an autumnal scene! Something to stitch this season definitely! I really love portrait! It'd be lovely for handstitching on my low volume quilts. Thank you so much for the giveaway! I like Breakdance best, and I would embellish my daughters favorite pair of jeans, on the back pocket. My natural inclination is to say flowerbox, though parlour is gorgeous too! Thank you very much for the giveaway! I like the brighter colors in Fruit Salad and Prism, I would stitch up some Christmas goodies with them! I love all of them, but I think fruit salad might be my favorite. The colors look amazing!!!!! I love the frosting palette! Wow, they look really nice! I like Fruit Salad the most. I love the flowerbox palette. I look forward to stitching with them all! Flower box or Fruit salad are the two I'm leaning towards, but they're all lovely! I love them all and it was so hard to choose! But Frosting is just about my favourite :) I'd love to stitch an afternoon tea scene with it. My eyes immediately landed on Fruit Salad before I even looked at the rest. I think Parlour would be perfect for the vintage patterns that I like to stitch. The whole palette is at the top of my Christmas list this year. The Mingles palette is unlike any floss I've seen before. It looks like butcher's twine and I would love to have the opportunity to work with it. Thanks for the wonderful and generous giveaway! I love the fruit salad palette! Gorgeous! love the frosting palette! i would use them to stitch up my pops some tea towels for christmas! I love the fruit salad palette! Canned mandarin? Yes please! 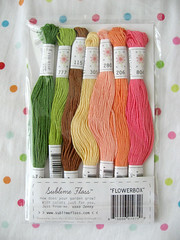 I would use Parlour for stitching up some chrysanthemums! They look like lovely fall colors. My first pick would be metallics. I went to a quilt show yesterday and I'm inspired to try having some nuances of shine in quilt blocks. Prism! I've been contemplating doing something for my toddler's room and those bright, bold colors are awesome! My choice is frosting..but also like flower box.. It is great that another thread is available. The names of the colours are wonderful. Frosting is one of my favourites. I plan to make a garden quilt next year. 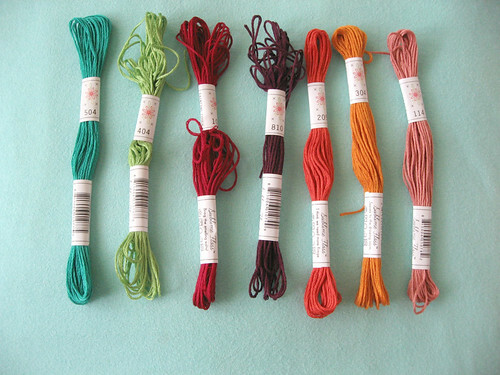 Fingers crossed I get to win some threads to stitch with. Thanks for the chance to enter the giveaway. My favorite is Fruit Salad. But then, all of them are yummy, will be great match with Sublime Pattern..! I like Prism a lot, but Taffy Pull is a close second. I love the Parlour palette! I would love to use Taffy Pull to stitch up my new inspirational quote : "I'm working on it. I'm working on beautiful things, good people, and happy times !" All of them! Top three would be Flower Box, Fruit Salad, and Parlour! Color bliss! Tough to choose just one...but I pick the Mingles. I think they would be really fun to use to stitch a couple vintage Vogart tinted pillow tops I recently found. They have cats & dogs on them & the Mingles would make the fur look cool! I love 'Frosting' the most but all of them are pretty! I would pick Prism - love me a good rainbow! - and I would stitch up some Vital Organs! Flowerbox would make some nice looking florals, I would think! It's really difficult to choose a favourite... they are all so pretty. But since I have to choose, I'd pick the Prism palette. Oh oh! I love them all!!!! I think bevause I'm currently stitching baby clothing, "frosting" would be my pick; those tones just fit so beautifully for that kind of thing! My favorite palette is Parlour, the colors look very vibrant and I would stitch a colorful Tiki-Head. It's hard to choose, but I think Parlour. There's something about that combination of colors together, not to mention each individual color! It's really tough to pick a favorite 'cause they're all great! I love Frosting but I think I'd choose Parlour. 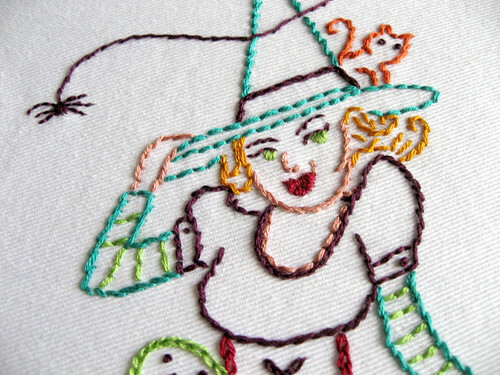 Last week I printed out the Kitsch Witch and just got my marking pen from Sublime this week so I would use it to stitch my witch! Thanks so much for the chance to win! Ooh! I love both Flowerbox and Parlour, but I'd pick Parlour if I win. mingles is my favorite...takes all the work out of combining colors...woohoo!! I am planning on dishtowels for girlfriends this Christmas so new floss would be awesome! Parlour is awesome, particularly Fainting Couch. It would work so well with an abstract free hand design I have on my brain. Must stitch! My favorite would have to be 'Frosting' looks just like icing on little cup cakes!!!!! I just bought the "Mythic Creatures" pattern, and I think it would look amazing stitched with the Fruit Salad palette. Chocolate Pudding Yeti, anyone? I would love the breakdance set to use for some wonderful Mexican embroidery, the colors would be perfect!! I love the Mingles. What a great idea to pre-blend floss. I also like Fruit Salad. I would love to stitch some pretty flowers for a quilt for my daughter. Definitely Taffy Pull or maybe the mingles or or or the metallics. Love the variegated for doing those swirly urban threads designs. I really like parlour and portrait, but I think I'm most intrigued by the Mingles thread - I'd like most to try it out. I have a wedding gift that I'd like to make soon and the Frosting palette would work well for it. The palette reminded me of Jordan almonds; I really like the name Reception Mint. The colors of the fruit salad palette speaks to me most but I love that there is actually a color called parachute pants! So awesome! The 'taffy pull' is my favorite! Love the colors. I love the Frosting colour way...sweet, soft, creamy...perfect for stitching something vintage on to pillowslips! They're all beautiful, but I think I like Parlour and Fruit Salad the best today. Tomorrow could be a different story! Thanks for the chance to win! I like the soft pastel of the Frosting set. 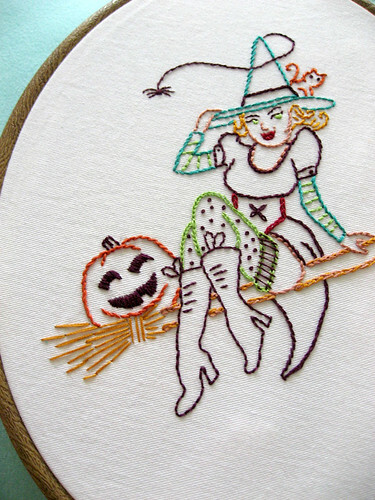 I think I would like to try the Kitsch Witch pattern with it!!!! Thank you!! Portrait - would be great for the Hairstyle series. The colours in PRISM and FLOWERBOX look like the colors I use most. I love those. But I would probably pick up a pack of PORTRAIT because it has all the colors I hardly ever use because I simply never think to buy them. Love the portrait and parlour palettes, if I had to choose between them would probably go with portrait but then again maybe parlour! I like Prism and it would be perfect for making my set of Ranbow coloured Dorset buttons. 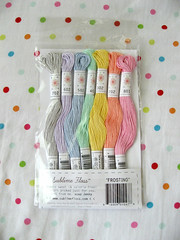 Love the taffy pull blends - perfect for the rainbow anatomic stitching I've been thinking about! I really like the Parlour palette. They remind me of Fall. These are amazing! I live the frosting pallet. I love the pastels of the Frosting set- so soft and pretty. They are all lovely, but I'd like to try stitching a portrait so the Portrait palette is my favorite! I love them all, especially Parlour and Flowerbox! Beautiful! Oooh! Portait just looks lovely :D I'm a bit of a novice so who knows what I'd do with it? Hopefully something that would do the pretty colours justice. I like Taffy Pull, although all the bright colors are great. 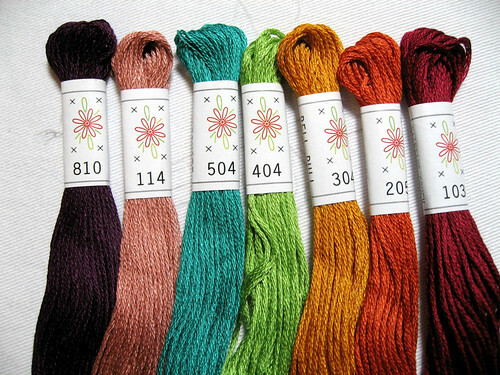 I'm planning a big sampler project for 2013, and these threads would be a great addition to it! Those palettes are lovely. If I had to choose it'd be three favourites: mingles, fruit salad and parlour. Not sure what I'd do with them, but being a colour collector/hoarder both when it comes to beads and to fiber I'd be very content just having them in my stash to pick up every now and then, stroke them and go "my precious". Of the three it'd probably be most interesting to try mingles to see what they actually look like stitched (or their own or mixed with solid colours). I love the Portrait palette and think it would be great to stitch the Black Apple pattern set I have been saving :) Thanks for the chance! Flowerbox, to embroider flowers....or parlour, for my next project. I love the name "breakdance" however my favourite for what I want to stitch next, which is a coral reef, is "Fruit sallad". I think those colors would be perfect! 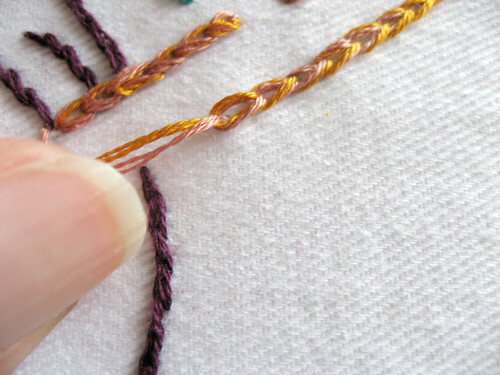 I love sublime stitching - their patterns are what got me started on embroidery. I love love love the Breakdance palette. Although a part of me wouldn't mind trying my hand at a glow in the dark project! So hard to choose, but Prism is first choice for me. I love the "Parlour" palette. I'm getting ready to start on Holiday gifts and would love some new colors! Parlor is my favorite, but Prism would be perfect for my next project, a welcome baby portrait. I think I would start out with Fruit Salad and use it on my current fave, tea towels. I can't wait to see how they launder. It's hard to pick one favourite, but I really like Fruit Salad. It would be great to try them on one of my TAST samplers. So tough to just pick one! I think I like Parlour the best. Fruit Salad and Taffy Pull are my favorites and you can't make me choose just one! I want them all. Can I say the 63 palette is my favorite...? These colors are beautiful! I'd love a chance to win! My favorite color so far is Leg Warmer, it conjures memories from the 80's when I wore them, completely unrionically. Thanks for the chance! Parlour is my (current!) favourite palette. I have the Molly Crabapple designed Sublime Stitching pattern waiting to go, and I think the saucy ladies stitched in the Victorian sounding threads would be a match made in heaven. Oh, I love them! I'd pick Flowerbox and stitch some little animals on bedding for the baby girl I'm expecting. Gorgeous colours. I love the "Parlour" palette. It would be perfect for a sampler I'm about to start! I love the Parlour set! I would love to stitch a funky paisley pattern on my bedroom pillows! Parlour is my favorite... really excited to try some. Fruit salad looks perfect to embroider some new cloth napkins. These are fabulous colors!! Too hard! But I love the fruit salad combination and the taffy pull is fun too! It's so hard to choose which one, the pallettes are all so lovely I want them all! Umm, ok maybe fruit salad has the edge! As much as I like the brights and bolds in color ranges...when I popped open the website to view the flosses...the "Portraits" really hit me! Something so calming about seeing them with the blending so complimentary to each other as a group. The flow from one to another in a soothing arrangement of anything from a landscape to even the sweetness of Victorian works of holiday elements (Christmas? Valentine's Day?). Yep, the "Portraits" would be my first pick! What a fabulous selection of colors. It is like a candy store over at Sublime Stitching. I would love to try their Taffy Pull pack or their Mingles. They would be so much fun with some kitschy kitties from Sublime Stitching or some vintage flower patterns. 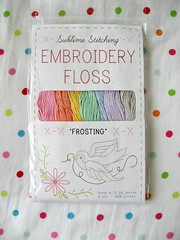 I think I got in just under the wire - Love your blog, and the floss looks YUMMY! Thanks so much!